Season of festivals has already begun. This is the right time to prepare varieties of sweet dishes. I am preparing this dish using fresh coconut and sugar. In northern Karnataka (India), we call fresh coconut as “Hasi Khobbari” (Tengina kai Turi). This is an authentic and traditional dish. I am preparing this dish using fresh coconut and sugar. Coconut is a very versatile and indispensable food item in all most all Southern states of India. It is a complete food which is rich in calories, vitamins and minerals. Coconut is a very healthy ingredient that can be used safely as food. We can prepare a wide range of sweet dishes from fresh coconut. I am showing you one of them. This dish is very simple, easy and requires very less number of ingredients and it consumes very less time to prepare. Let’s see how to prepare Hasi khobbari burfi/fresh coconut fudge. Break the fresh coconut and hold the coconut water in a bowl. Grate the coconut and keep it in a bowl. One thing you have to understand that, sugar used to prepare this dish is half of the measurement of the grated coconut. 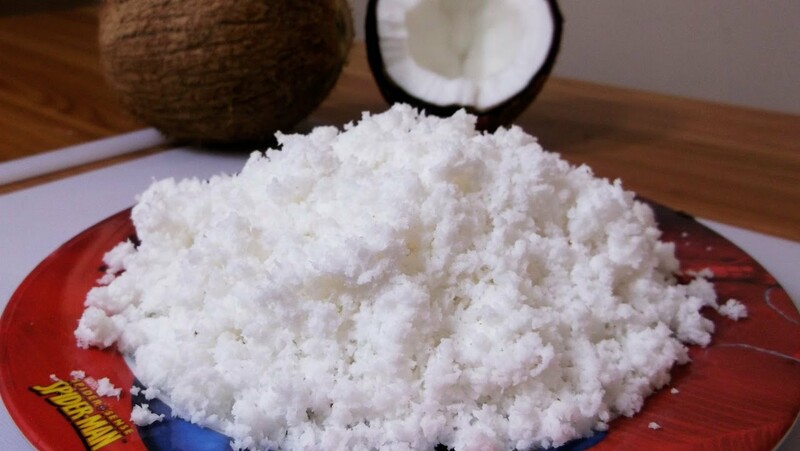 If you are using readily available fresh grated coconut available in the market, you need not worry about coconut water, instead of coconut water, you an use plane drinking water. Pour grated fresh coconut, sugar and one cup of coconut water or plane water(which ever is available) into a frying pan. Toss the mixture thoroughly with the help of a long spoon. Keep it aside for 5 minutes so that sugar will dissolve in water and time will be saved in preparing the dish. Meanwhile, take a big stainless steel plate or tray and grease it with 4-5 drops of ghee/clarified butter and keep it aside. Place the frying pan on high heat for 2 minutes. Reduce the heat to medium once the stuff starts boiling. Stir it continuously otherwise the stuff may stick to bottom and the whole dish may get spoiled. Go on stirring it untill the stuff will get sticky structure or you can wet your fingers and take a small quantity in your hand, You feel the stickyness of the burfi. The whole process may require 15-20 minutes. Once the stuff starts leaving the pan or the whole stuff sticks to spoon, take it out to the greased plate. Take another spoon and apply remaining ghee/clarified butter on back side of the spoon. Spread the stuff all over the plate with the help of greased spoon. Wait until it gets cooled and cut them into square or any shape of your choice. You can store them in a bottle for 15 days. Tasty and delicious Hasi Khobbari burfi/Fresh Coconut Fudge is ready to serve. Isn’t it amazing!